There is, to our knowledge, no institution of higher education in the United States that has taken such a bold and innovative measure to address the root causes of poverty and crime. Over the last 30 years, the number of people incarcerated in America has quadrupled, with more than 1 in 100 Americans behind bars. Nowhere has this troubling development been felt more painfully than in the Black and Hispanic communities where, according to the U.S. Department of Justice, one in every three Black males and one in every six Hispanic males can expect to be incarcerated at some point in their lifetime. At the same time, younger generations of these communities continue to drop out of schools at alarming rates and the relation between crime and lack of education is not to be dismissed. Every year approximately 675,000 people are released from custody; many of them undereducated. Unemployment rates for those with criminal records are well over 50% and thus the prospects for a meaningful and productive life remain more and more of a fading dream. Broken dreams, however, are more than the plot of a sad story, they also create the cycle from which so many of our minority youth seem unable to escape: poverty, crime, sometimes violent crime, and imprisonment. With the national recidivism rate as high as 67%, we realised that it is imperative to offer meaningful opportunities to those released from incarceration so our prisons do not remain the revolving door that they have become. Despite all of this discouraging news, I saw that there was a clear answer to the problem - higher education. We started the E3MC program in July 2012 at Manhattan College with a simple goal of changing the course of lives by creating social and economic opportunities with college education to those who are least likely to receive it. Our program offers a college class each semester at the Rikers Island Correctional Facility in New York City to ten students selected from the confined population. Ten other students from our main campus in the Bronx travel to the jail each week to study and learn with and from their confined brothers and sisters. 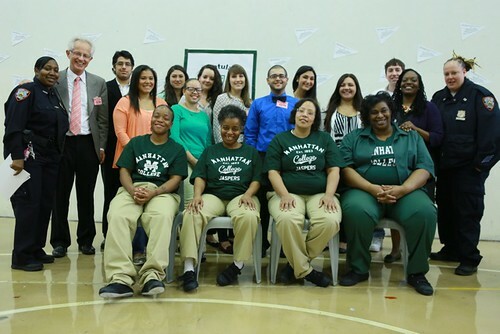 “Inside” students who are accepted into the program enter the accredited class - Criminal Justice Ethics - and, upon release from the New York City Department of Corrections, are offered an opportunity to enroll in Manhattan College and complete their degree, at ideally no cost to them. While enrolled at Manhattan College, the former offenders benefit from all of the services that other students receive: full library privileges; gym, fitness center, and health clinic access; and the right to avail themselves of the counseling center and academic tutoring. If all of this sounds counterintuitive, you are correct. If not, come and help us make this program better. Our single college class has proven to be a catalyst for young adults to broaden and brighten their own life horizon. We work with young adults in the Rikers Correctional Facility to provide them a shot at continuing their education. The project not only intervenes at the facility but also allows them upon release to attend a full program at Manhattan College with access to all facilities that other students access to create their future. While we do this, there is an urgent need to support our released students and graduates, mainstream into society. This problem has different aspects and is fairly complex. We are looking for people to give us strong implementable ideas to tackle this issue and help make mainstreaming smoother. Our challenge to you is to identify one issue you feel strongly about which the incarcerated young people confront upon release and help us understand how we could tackle it in our program. I teach Religious Ethics at the Manhattan College in New York. The TOP FIVE responses will each receive a handwritten note of thanks from me. The best response will receive a copy of my latest book - The Last Judgment: Christian Ethics in a Legal Culture - published by Ashgate.